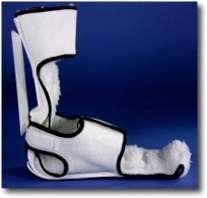 PRODUCT DESCRIPTION: This versatile splint is designed to position the foot and leg while suspending the heel to prevent necrosis. The brace gives the practitioner MAXI-mum control of positioning in 4 ways. Internal and external rotation can be blocked by use of a posterior swing bar. This same bar can be set to hold the foot at a range of angles of rotation. A unique slotted mechanism provides variable plantarflexion/dorsiflexion positioning. The distal toe protector may also be adjusted to relieve bed sheet stress.